Here’s how to set up your home page. 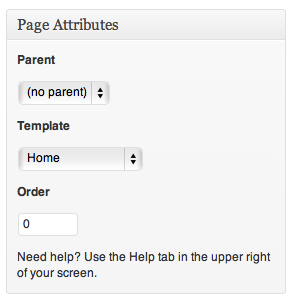 First go to the “Pages” section in your WordPress control panel. Create a new page. In the right hand column you’ll notice a box labeled “Page Attributes.” In that box choose “Home” from the template drop-down menu. Publish your page. Next go to the Settings section of your control panel and choose “Reading.” At the top, you’ll notice a option to choose what your “Front page displays.” Choose “A static page” and then select the home page you just created from the drop down menu. You can also specify a page here to serve as your blog (all posts) if you’d like to. Update your settings.